There’s no need to spend a fortune on perfumed beauty products when there is a whole host of natural remedies sat in your kitchen cupboards. One of them is the tomato. They contain the age-defying ingredient lycopene – natural pigment that makes tomatoes red. The highest levels are found in processed or cooked tomatoes used in ketchup, paste, soup and juice. Dealing with oily skin is a challenge many of us face. For a wholesome solution, combine organic tinned tomatoes, honey and a few drops of lemon juice in a blender to create your own natural cleanser that will combat excess oil without the perfumes drying out your skin. Apply organic tinned tomatoes to the affected areas for a natural remedy. In addition, regular consumption can aid in preventing future burns as well as fight signs of ageing caused by the sun. 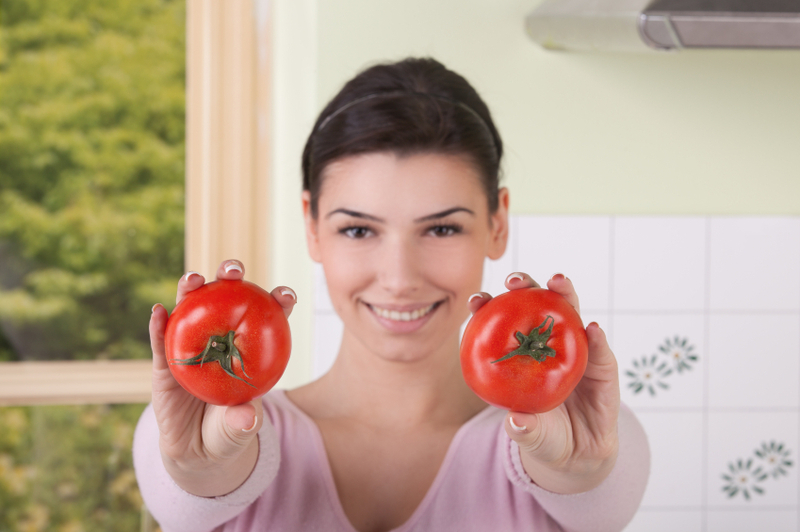 A study by Newcastle University found women eating a diet rich in processed tomatoes had increased skin protection, as seen by a reduction in skin redness and less DNA damage from ultraviolet (UV) exposure. For skin that glows and feels soft and smooth, combine a tin of organic tomatoes, with a few lemon drops, two cups of sugar and a bit of coconut oil for the ultimate body scrub. Tomato juice makes a brilliant hair conditioner – adding the shine back to lifeless locks by increasing the your hair’s acidic pH. Use it in the same way you’d normally use a conditioner – massage a small amount of juice into your hair after shampooing, leave for a few minutes and then wash out. Tomatoes, which are high in vitamin C, vitamin A and citric acid, are a natural blackhead remedy. They contain unique acidic properties that work to unclog pores and get ready of unsightly blackheads. Cut a tomato in half and press into blackheads. Rinse off and then moisturise your skin.